Just make sure you watch out for oncoming trains or dark, narrow tunnels that appear out of nowhere. We had spent the morning at the Temple of the Tooth in Kandy before our group took a walk down to the train station to for our return journey to Colombo. At the entrance to the train station proudly stood a beautiful wooden signboard with locations and times of the trains, all manually adjusted. A little piece of history, a remnant of a bygone time. Before I jumped on the train I took a quick pit stop at the “tourist” toilet. I wasn’t brave enough to check out the locals' toilet to see what was so special, but it certainly was clear evidence of the deeply entrenched class structure. My train ticket was for first class, but this isn’t to be confused with our Eurail first class tickets in Western Europe. 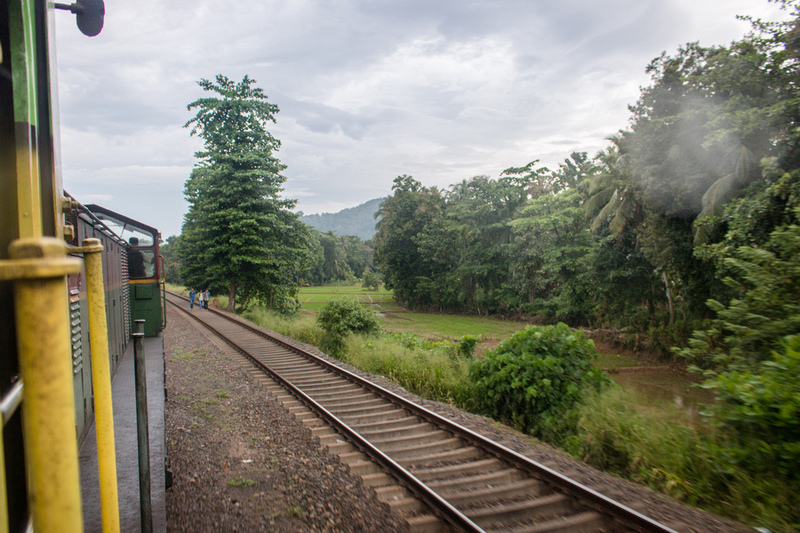 “First class” guarantees access to a carriage with air-conditioning, a fairly ordinary seat and mild refreshments, which according to a regular priced train ticket is a wonderful luxury on a Sri Lankan train. I settled in for my train ride, determined to get some work done, with the occasional glance out the window to admire the countryside. Suddenly the excited tell-tale chatter of bloggers sprang from the hallway at the end of the carriage. Ever the nosey-parker, I just had to investigate. Sliding open the door at the end of my carriage I entered the warm, humid narrow hall and immediately noticed that it was quite breezy. There were no visible external doors, instead just a cavity where you’d normally expect a door to be, and in the openings were several friends dangling. My first instinct was to save them from certain peril. I felt confused by the sounds of their giggles, but came to the realisation that they were throwing themselves outside the train for fun. It only made sense to follow the crowd, right? So once the doorway was available I decided to follow suit. And it was exhilarating! A million times more fun than sitting in a seat, that’s for sure. The countryside was gorgeous. 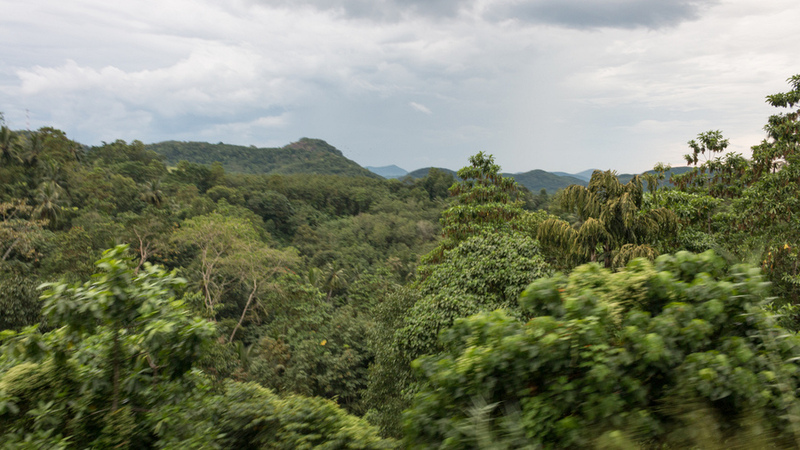 Lush, green jungles with the occasional deep dark tunnels coming out of nowhere. I really had to stay alert when travelling outside a train. It’s would have been easy to lose my head… literally. I spent many moments soaking up the view and wafting in the tropical breeze. Watching the landscape rush by in a blur of motion that looked like a wildly painted green canvas. The unbridled freedom which comes from a previously forbidden act was as refreshing as the wind whipping through my wispy hair. After a while I made my way back to my seat to finish the journey in the proper, civilised way. I had ticked off a buck list item I never knew I had. Somehow catching a train will never be the same again. In fact it may always be tainted with a tinge of boredom in the absence of the thrill of flinging myself out the door and into the fast-moving fresh air… a moment of freedom, adventure and life running through my veins. The very definition of living life on the edge. It looks exilerating to hang outside a train, but how did you convince the kids not to follow suit? 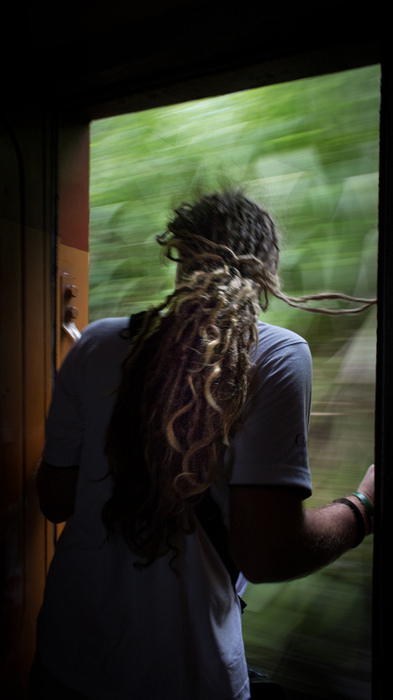 I felt like I was hanging out of the train with you, what a fun experience.